Slow Cooker Chicken Dinner | Relish! We love using the crock pot. Let it go to work, and come home to this delicious family favorite! Mix the brown sugar, salt, paprika, thyme, pepper and flour in a medium mixing bowl. Remove the skin from all of the pieces of chicken, except for the wings. Turn the chicken pieces in the flour mixture until thoroughly coated and pat off excess flour; reserve any extra flour mixture. Heat the oil in a large skillet over medium-high heat. Brown the chicken on both sides, about 4 minutes per side and transfer to a plate. Use a lid because it splatters! Add the onion, carrots and celery and sauté until lightly browned, about 4 minutes. Add the reserved seasoned flour and stir until the vegetables are coated. Add the wine and bring to a boil. Add the chicken broth and simmer until slightly thickened, pour into the cooker. Arrange the potatoes in the cooker, add the drumsticks and thighs on top of the vegetables and the breast halves on top of the dark meat. Cover and cook on low for 5-6 hours. Remove the broth from the slow cooker and place in a small saucepan. Add the Wondra flour to the broth and heat on high for 2-3 minutes until thickened. 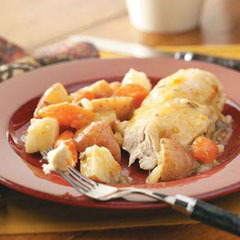 Remove the chicken to a serving platter and surround with potatoes, carrots and celery. Serve with gravy and garnish with parsley.